From 1892, very possibly the earliest existing recording of the famous Spanish waltz, Over the Waves. Announcement "For the benefit of the audience, the United States Marine Band will play the following Spanish waltz entitled, 'Sobre las Olas', or translated in English, 'Over the Waves'. Record taken for the Columbia Phonograph Company of Washingon, DC." Enjoy this one-of-a-kind original recording by John Philip Sousa's United States Marine Band of the now classic waltz by Mexican composer Juventino Rosas (1868–1894). This was recorded during Rosas' short lifetime: He composed this piece before he was 20, it was published in 1888, the Columbia Phonograph Company began recording it in 1892, and Rosas died two years later at the age of 26. To learn more, see the Wikipedia article about Juventino Rosas. This recording was made during the early years of the Columbia Phonograph Company, at a time when their recordings were given the extra care of an individual announcement (listen for the thunks before and after the announcement). Extra care was also afforded to record labelling: the supplier of the wax cylinder blanks, the North American Phonograph Company, formed the cylinder ends with raised ridges which were intended to hold a delicate paper ring with the selection title and description printed on it. Many of the regional record companies did not commit the extra time and expense for the paper rings. Some used heat-stamps, others hand-etched a title. But early on, Columbia made the effort to sell their records with these rings. Nevertheless, most of the rings have long been torn or fallen off. See the September 1999 Cylinder of the Month to see an intact paper ring, as well as, learn more about and hear another early recording made at the Columbia Phonograph Company Washington, DC studio. 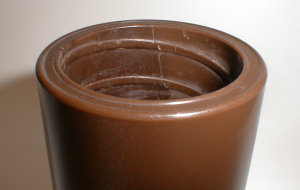 An example of the raised ridges on a North American Phonograph Company wax cylinder.